This project explored basic questions in the design and implementation of an audio-only computer-base football game; such as size of playing area, orientation, awareness of team mates and opponents and basic navigation. The project also explored more advanced design issues, not addressed by previous audio only ball games, involving the provision of a multi-player perspective, requiring the provision of an intuitive means of supporting changes in the focus of the interaction in audio. 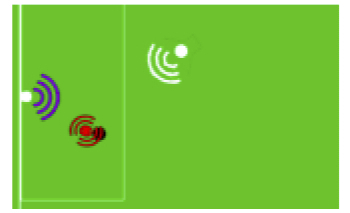 In general the dynamic, multi-player perspective poses interesting questions of how to provide real time and interactive sonification of ball and player positions and how these should be managed within the context of the changes in interaction focus mentioned above. To assist with these and other design questions, advice was sort from past and present players of the British blind football squad. The information gathered ranged from basic facts about the rules and conditions under which games are played, through to discussions about the role of echo location in providing an awareness of physical features of the pitch and the proximity of other players. This in turn led to the question of how realistically to present the information provided through echo location in a virtual auditory display. Thus the project also explored the potential roles of audio-only game systems in team coaching, exploring the practical applications of audio game representations to realistic coaching scenarios.